Well, today, I did some detective work after a long time. I have close to 5000 friends on Facebook and because of this huge number of friends in my FB ID, I am not able to add more friends to my list as the pending Friends request list has also swelled up to more than 1000. But I constantly check the friends request I get and also read all the messages in my other folder. Yesterday, when I received a friend request from an ID called "Kathy Joan", I just started laughing because I immediately recognised that face from a dubsmash video I had watched in the recent past. What caught my attention was that I had three mutual friends with that ID. A simple image search of the image used in the profile gave the following results. So from an initial analysis, I figured out that this was a fake ID. But why would a fake ID target us? 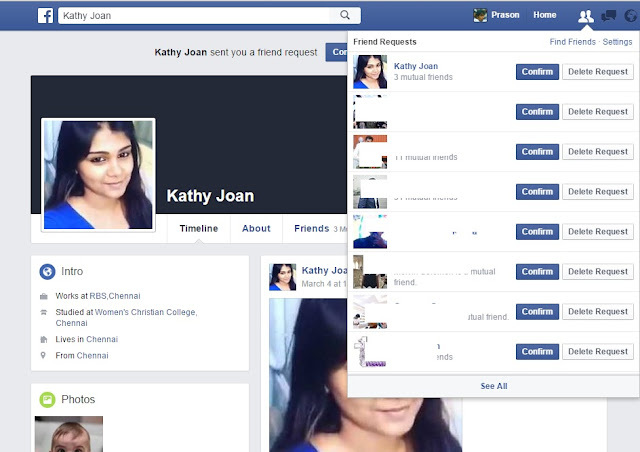 And what about the 3 mutual friends? When I looked into the profiles of the 3 mutual friends, I figured out that all 3 of them are from the same locality where I live (or have been in that locality) and all 3 of them have a musical background. 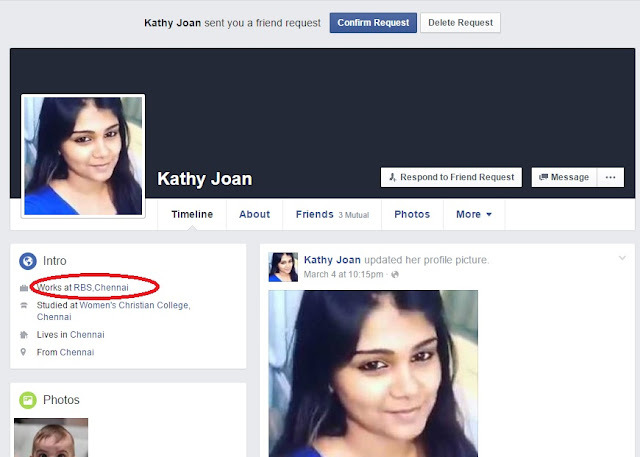 The profile also read that the person was working in RBS, Chennai. I called up both the bank and the MBA college and came to know no such person works there by that name. One more detailed search of the friends list brought me closer and narrowed my analysis to two people. At first I thought it must be a guy who is posing as a girl. But with a detailed analysis, I have zeroed down my doubts on two people - 1 is a guy and 1 is a girl. The irony is that I talk well with both these people. I don't want to name them here. They may have used the fake ID to see how I chat with a girl. They might have added the common friends to do the same too. LOL. So you became Sherlock for some time eh? OMG.. You mean I have been chatting with a guy named "Kathy Joan"? She..Er He was very friendly...!